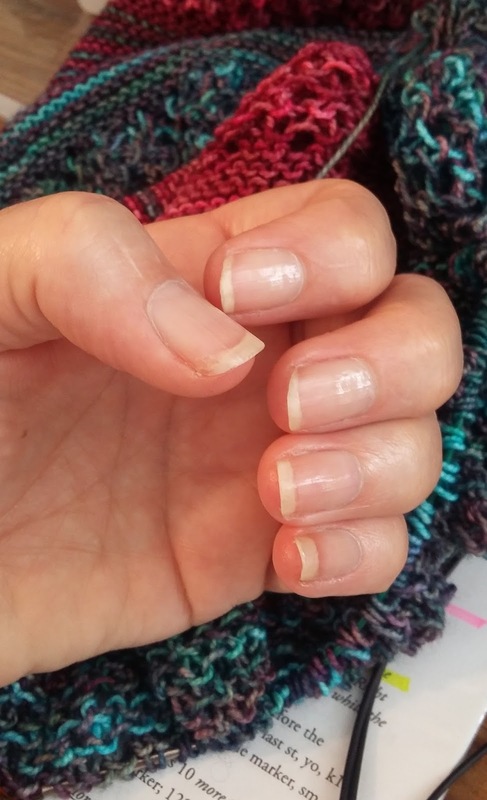 Jeannie Gray Knits: I have nails! I'm jumping up and down with excitement. I'm over here like 'I just won the yarn lottery' excited! Believe it or not, in my almost 55 years of existence, I have never had my thumb nails grow past the tip of my finger. Never! But now.... Just look! I can actually feel my fingernail sticking out past my skin. I am just SO excited! How did this come to pass, you ask? You may remember that I started taking Biotin last April. You can look here to see how bad my nails were. If you look here and here, you can read about how the Biotin made my hair grow like crazy & how it had made my nails stronger but they weren't actually growing. You may also remember that I grated the center strip of my thumb nail off with a cheese grater right before Christmas. (Can you say, Klutz!?) That injury is a little hard to explain. The grater took the center strip of my nail, but in typical grater fashion, it cut on an angle. 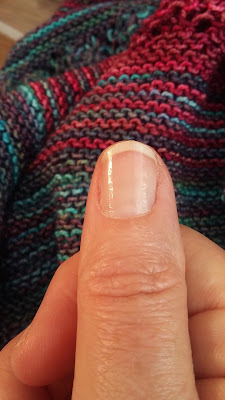 So over that center strip, about half my nail was completely gone then there was a VERY thin layer of nail that gradually thickened to barely-scraped up close to my nail bed. I'm not sure if that makes sense to folks who've never grated their nail off with a cheese grater, but that's how it was. It just so happened that a few days after the cheese grater incident, I had my annual appointment with the dermatologist. I asked her if she had any nail growing recommendations, which of course, she did. Nailiques, Biotin and always wear gloves when washing dishes or using chemicals while cleaning the house. Well, I haven't exactly followed the glove wearing rule. I just can NOT stand to wear rubber gloves for any length of time. Just the thought of them makes my skin crawl. And I was already taking the Biotin. In early January I found the Nailiques at my local Target (for Much more than it costs on Amazon, I might add. Why didn't I think to look on Amazon first??) Anyway, I bought it and less than two months later, I have nails! Even my grated off thumb nail has grown out. The center strip is still a little thinner out towards the end of my nail but give it another month and even I won't be able to tell I ever tangled with that dammed cheese grater.